Me and Max absolutely love seeing shows. We've got our fair amount of pantomimes, musicals and short plays under our belts, and he's just starting to concentrate long enough in those slightly longer plays. When Lighthouse Poole invited us to go and see I Believe In Unicorns, a play based on the story by Michael Morpurgo, I jumped at the opportunity. It's a book that I loved and we couldn't wait to see the adaptation. Put on by Wizard Presents Theatre Company, I Believe In Unicorns is an interactive play that has been adapted from the novel of the same name. The story tells the tale of Tomas, a boy that hates reading. His mum entices him into the library and he is soon spellbound with the storytelling of the Unicorn Lady and her pet unicorn. Throughout the play, you learn about his love of listening to the stories and his new found captivation for reading. That is until the fires come in the war and the library starts burning and he's drawn to saving as many books as he can. The play is a one lady show. Danyah Miller captivated the audience from little to big with her storytelling. Creating a world that left you yearning for more and not wanting to leave. 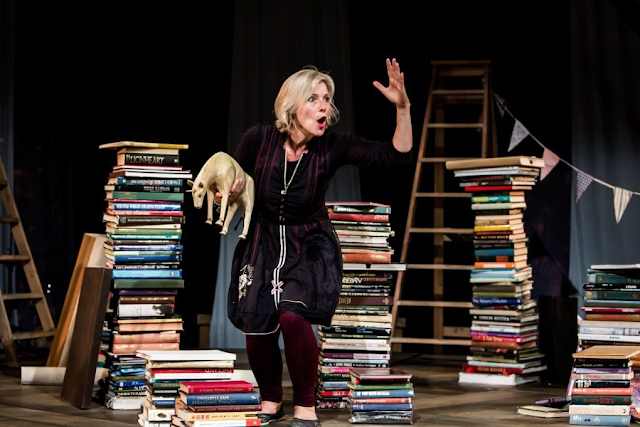 Playing the Unicorn Lady, she ignited the imaginations of the audience whilst keeping the story going. Getting children to help with creating stories and asking for help with remembering key facts about the story. It was a beautiful adaptation and one that kept everyone on the edge of their seats. The staging was probably one of my favourite sets I had seen for a long time. Comprised of lots of stacks of books, there were bits and pieces hidden in each of them to help with the story telling. From ladders to kites, to even smaller books and pop up houses. Each book added something to the story and almost added another character to the show. Not for one moment were our eyes not fixed on the stage. There was a small projector hidden in a book to allow you to feel like you were on fire, under the water or even flying in the sky. It was utterly magical and warmed my heart to know that old books were being used in such a brilliant way. 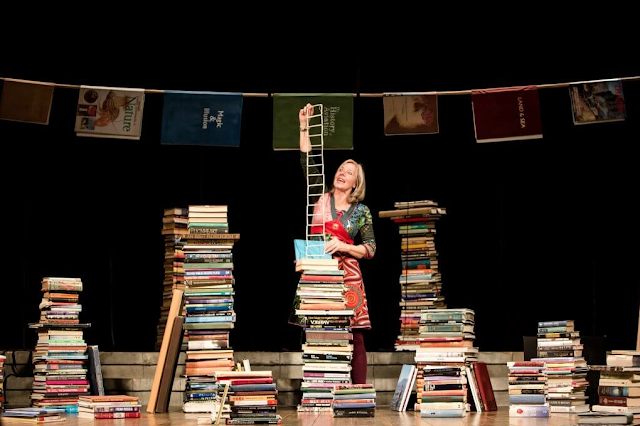 With books playing such a major part in the show, guests are invited to bring along an old book and take one from the swap pile outside the theatre. Some of the books even make it into part of the set. Max loved the idea of sharing an old book with someone else and even jumped for joy when he saw a little girl proudly walk around with his old and loved book. I Believe In Unicorns was a show that me and Max adored. One that we came out of talking about our favourite books and wanting to go to the library and enjoy ourselves. It was utterly brilliant and we really do believe in unicorns now. Thank you Wizard Presents and Lighthouse Poole for capturing our imaginations and bringing us a show to love and cherish.